From this article, you can get the way to extend disk volume including system partition and data volume on Windows Server 2012 R2. Download IM-Magic Partition Resizer Server to extend disk volume when it is running on low disk space on Windows Server 2012 R2. Windows Server 2012 R2 has a better disk management, but the disk partition will still run out of disk space when more and more data is stored. Disk Management on Windows 2012 R2 has the function of managing disk. However, if you want to manage the disk space in a better way when it is running out of disk space, you can rely on the third-party partition software. IM-Magic Partition Resizer Server is specialized partition software that can resize disk partition on Windows Server easily and effectively. How to Extend Volume on Windows 2012 R2? Download, install and launch IM-Magic Partition Resizer Server. Right click a partition that has enough free space and go to "Resize/Move" option. When mouse shows double arrows symbol, you can move the arrows to squeeze some unallocated space from the selected partition. You need to move the unallocated space close to the partition you want to extend. 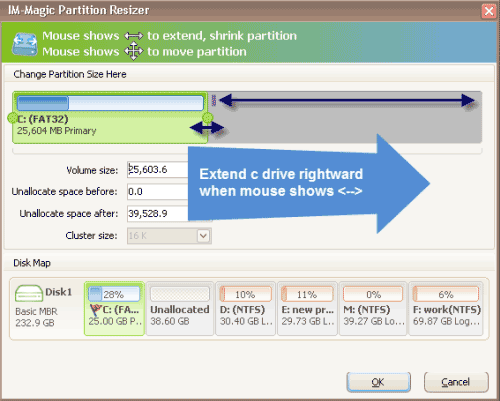 Then, right click the partition you want to extend and select "Resize/Move" option. Firstly, you should check if there is unallocated space on the same hard disk. If there is no unallocated space, you need to open Disk Management and select a volume that has free space. Then, you can right click this volume and select "Shrink Volume" option. Secondly, after shrinking, you can see some unallocated space which displays behind the selected volume. You need to move the unallocated space close to the volume you want to extend. Since Disk Management cannot move a partition, you need to delete the volume between the unallocated space and the volume you want to extend. Finally, you can right click the volume you want to extend and select "Extend Volume" option so as to add the unallocated space to the selected volume. From what mentioned above, you know that the disadvantage of Disk Management is that it cannot move a partition. In order to resolve this problem, partition software is a good choice. IM-Magic Partition Resizer Server makes it easy to resize hard disk including shrinking partition, extending partition and moving partition on Windows Server 2012 R2. This partition software can help extend volume without deleting partition or touching any data. It can extend C drive partition, system partition, boot partition, primary partition and data volume without rebooting your computer. IM-Magic Partition Resizer Server also enables you to extend disk partition on RAID 5 disk on Windows Server 2012 R2. If there is enough free space on RAID 5, you can run the partition software to extend partition on the RAID 5 easily by performing a few mouse clicks and drags. 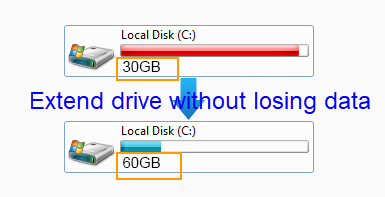 If there is no enough free space, you can also add new disk to RAID 5 array for partition extending. IM-Magic Partition Resizer Server will not touch any data when resize hard disk on Windows Server 2012 R2, but you had better backup important data if you need to rebuild RAID 5 array. Have you ever installed Virtual machine on Windows Server 2012 R2? When disk partition, especially C drive system partition is running out of disk space in VMware on Windows Server 2012 R2, you will feel helpless to resize the hard disk. However, with IM-Magic Partition Resizer Server, you can resize C drive system partition and other data volume in Windows Server 2012 R2 VMware. If you want to resize C drive system partition in VMware, unallocated space is also needed on the virtual disk. If there is no free space on the virtual disk, you need to add more space to the virtual disk. This partition software can resize disk partition without any influence on the VMware or operating system, so you can completely rely on this software without any worry.